motorcycle helmets. Condition is Used. Dispatched with Royal Mail 2nd Class. A mint condition hardly used RX-7 GP Helmet no marks, scratch’s or blemishes of any kind. Scrambler By Ducati. HARLEY DAVIDSON / DUCATI. & virtually every motorcycle product currently available from our wide range of suppliers. Make us your first choice for all your Motorcycling needs. RIDERS OF BRIDGWATER. The shell is made of SFL fiber, comfortable and lightweight with extra strengthening ribbing. Strong personality for the gentleman rebel. DUCATI SOUL. HARLEY DAVIDSON / DUCATI. Make us your first choice for all your Motorcycling needs. A perfect mix of style and functionality. SFL (Super Fibre Laminate). Flares out for easier putting on and taking off. Racing closure with D-ring fastening, with button to secure the strap FFS (Free Flow System). Featuring dual P/J approval - which covers both its full-face and open face use - it is equipped with a chin guard featuring a dual safety opening system and a complete ventilation system. The removable and washable internal padding, the sun visor with UV 400 protection, and the reflex inserts for greater visibility complete the design of this product with a minimal-chic look by Drudi Performance, exclusive for Ducati. 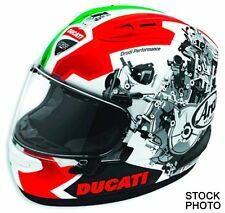 DUCATI CORSE SPEED ARAI HELMET RX7-V. Size XL. With 3 Arai Visors. Arai Ducati Corse Speed Size XL Presented as pictured in a brand new, unused condition. With 3 Genuine Arai Visors, Dark smoke, Light smoke, and Clear. UK mainland delivery only. Thanks for looking. Ducati & Harley-Davidson main dealers based in Bristol, England. Size Large= 59- 60cm. Arai has continually improved the glancing off performance by learning from real scenarios. Arai uses a net structure core, assembled and bonded within Super Fiber and other special synthetic fibers. SCRAMBLER BY DUCATI. HARLEY DAVIDSON / DUCATI. Racing closure with D-ring fastening, with button to secure the strap Spaces for speakers. SIZE=SMALL=55-56CM. & virtually every motorcycle product currently available from our wide range of suppliers. DUCATI CORSE V3. InsideFacial Contour System (FCS). With neck exhaust to enhance hot-air extraction from the interior. Air suction from eye port to side duct Ventilation with new slide shutter: reduced wind noise, improved durability and waterproofing. A perfect mix of style and functionality. Detachable, washable hypoallergenic inner lining Facial Contour System (FCS). SFL (Super Fibre Laminate). Flares out for easier putting on and taking off. Racing closure with D-ring fastening, with button to secure the strap FFS (Free Flow System). Item no. 981040184. Ducati Corse Arai SBK 3. SFL (Super Fibre Laminate). This is the basic Arai outer shell tht is strong and lightweight. Ergonomic shape. Improved comfort and wear-ability with minimized turbulence. Based on the Arai QV-Pro shell and made with Super Complex Laminate Construction (SCLC), it combines a new internal ventilation system with VAS (Variable Axis System) sports visor, which allows you to have both a wide field of view and an area that is as resilient as possible around the temples. DUCATI CORSE. With neck exhaust to enhance hot-air extraction from the interior. Air suction from eye port to side duct. Facial Contour System (FCS). Wider visor for a perfect peripheral vision. HARLEY DAVIDSON / DUCATI. DUCATI CORSE. Facial Contour System (FCS). With neck exhaust to enhance hot-air extraction from the interior. Air suction from eye port to side duct. Wider visor for a perfect peripheral vision. HARLEY DAVIDSON / DUCATI. Item no. 981040186. Ducati Corse Arai SBK 3. SFL (Super Fibre Laminate). This is the basic Arai outer shell tht is strong and lightweight. Ergonomic shape. Improved comfort and wear-ability with minimized turbulence. Item no. 981040155. Ducati Corse Arai Chaser SBK 3 Black. SFL (Super Fibre Laminate). This is the basic Arai outer shell tht is strong and lightweight. Ergonomic shape. Improved comfort and wear-ability with minimized turbulence. Item no. 981040156. Ducati Corse Arai Chaser SBK 3 Black. SFL (Super Fibre Laminate). This is the basic Arai outer shell tht is strong and lightweight. Ergonomic shape. Improved comfort and wear-ability with minimized turbulence. 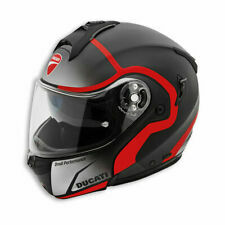 Ducati Corse Racing Helmet Red and Black Beautiful!